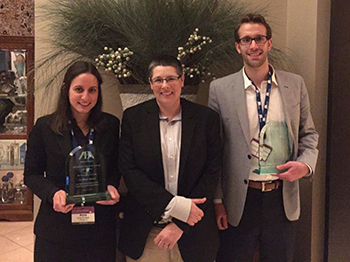 A Northwestern Pritzker School of Law team won first place in the JD division of the American Bar Association’s (ABA) 16th Annual Law Student Tax Challenge held last month in Orlando, Florida. Tyler Johnson (JD-LLM Tax ’17) and Anna Peckjian (JD ’18) were coached by Professor Sarah Lawsky. The challenge is designed to give students an opportunity to research, write about, and present their analyses of a real-life tax planning problem. “I wanted to compete in the ABA Tax Challenge because I thought it would be a good opportunity to practice oral advocacy skills. Oral advocacy may not be the first thing that comes to mind when people think of tax lawyers, but I think it is such an important skill for attorneys to develop. This challenge was a fantastic opportunity to do so among highly respected tax attorneys and U.S. Tax Court judges,” said Johnson, who will clerk for Judge Tamara Ashford of the U.S. Tax Court later this year. Northwestern Law teams have won the LLM Tax division of the competition six times in the past decade, but Johnson and Peckjian are the first JD team from the Law School to participate.